The Center City District, which produces Restaurant Week and Sips, wants to learn more about your shopping habits to help make Center City’s shopping experience the best and most exciting it can be. Take our quick survey and enter for a chance to win $500 in gift certificates from some of the best restaurants in Philadelphia! 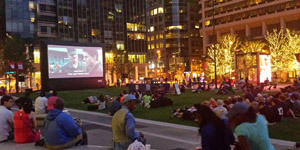 What nights would be best for a film series in Dilworth Park this summer? What types of films should be shown? Take our survey and let us know! VERTS Mediterranean Grill - Opens Friday! Join VERTS Mediterranean Grill to celebrate the grand opening of their Center City location! On March 10, at 1601 Market Street, they're offering all guests one free, full-size entrée from 11am-9pm, while supplies last. Choose from savory pitas, salads, and bowls, all loaded up to your liking with your choice of protein, toppings, and delicious sauces. The first 100 early birds to arrive will receive complimentary swag bags including VERTS t-shirts, totes, sunglasses, and more. As part of its commitment to the community, VERTS will donate 100 percent of sales of sides, drinks and extra entrées on opening day to the CAPA Foundation, whose mission is to provide support to the Philadelphia High School for Creative and Performing Arts. The 2017 PHS Philadelphia Flower Show, "Holland: Flowering the World," will celebrate the beauty and ingenuity of Dutch culture, from vivid flower fields to innovative eco-design, March 11-19. Guests will be transported to the rainbow landscapes of tulips, hyacinths and daffodils and the cut-flower and bulb markets that have shaped Dutch history. America’s premier floral and garden designers will celebrate facets of Holland’s culture throughout 10 acres of exhibition halls, with bridges, windmills, canals and water gardens in a sea of 30,000 flowers. Mixed in with thousands of tulips will be hundreds of fritillaria, narcissus, anemones and other blooms. New this year: The World Market featuring a Dutch Shopping Village of imported and domestic specialties; opportunities to create a take-home bulb garden or crafted planter; lively Designer’s Studio demos and real-time competitions; the PHS Pop Up Beer Garden; and free tastings at the Fine Wine & Good Spirits store. Also new- the Garden Spa, where guests can opt for a variety of ways to relax, recharge and be pampered. And back this year for families- the popular Butterflies Live exhibit, where more than 1,000 butterflies of 20 exotic and American species interact with guests. This year's Annual Symposium in American Art at the Pennsylvania Academy of the Fine Arts (PAFA) examines the creative contributions of American artists and citizens before, during and after World War I. Conversations will consider the relationship between military conflict and visual culture, the deployment of everyday citizens in the pursuit of national agendas through art and art-making, evolving racial and gender roles, and the interminglings of memory and mythology in understanding our own history. Tours with PAFA’s cultural partners will expand the conversation into other disciplines through the examination of special World War I related collections around the city in smaller groups. The symposium runs March 11, 9am–5pm and March 12, 10am–1pm. $50 for members. $75 general admission. Registration includes a Saturday evening reception with cash bar and hors d’oeuvres. Choice of tour can be made during the registration process. SoulCycle, the country’s premier full-body indoor cycling and lifestyle brand, opens March 16 in Rittenhouse Square! SoulCycle Rittenhouse Square features a 58-bike studio, home to the signature SoulCycle fitness experience, and a lifestyle boutique selling SoulCycle’s original performance and athleisure clothing collections. Additional rider amenities include full men’s and women’s locker rooms with four and five showers, respectively, and multiple bathrooms. At SoulCycle, riders engage in high intensity cardio (burning between 500-700 calories in 45 minutes), while also toning their upper bodies using hand weights and core-engaging choreography. Classes cost $30. On March 24, 7-10pm, join Chef Jose Garces and friends for an evening to benefit the Garces Foundation. Enjoy tastings from the area’s brightest chefs and a silent auction while making a difference in the lives of Philadelphia’s immigrant community. VIP admission ticket holders will receive access to the VIP Reception (6-7pm) as well as exclusive access to the Chefs’ after party (9pm-Midnight) on the 33rd floor of the Loews Hotel. Early admission ticket holders also receive access to the VIP reception as well as the main event. Tickets are available at GarcesFoundation.org/2017benefit/. Use code "friends10" for a 10% discount.